Today, SEO specialist Yoast has released a brand new WordPress plugin: Yoast Comment Hacks. 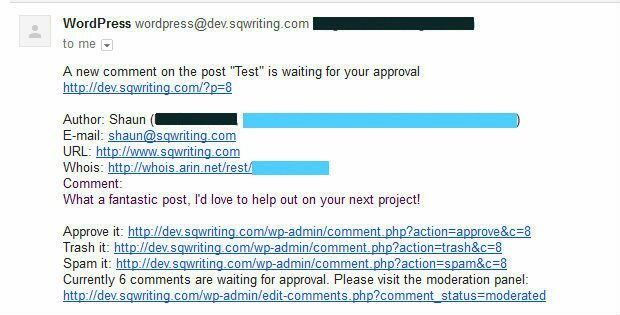 As the name implies, this plugin adds improved functionality to the default WordPress commenting system, making public some of the functionality already used by the Yoast team. This comes at a time when many WordPress bloggers are turning their comments off for good—now where’s the fun in that? By making the default commenting system more bearable to use, Yoast hopes that their new plugin will encourage WordPress users to value website community. One of the anti-comment brigade’s favorite arguments against comments is that people aren’t writing anything meaningful anymore. For every in-depth, informative comment one of your readers leaves, you probably receive ten ‘nice post!’ messages. 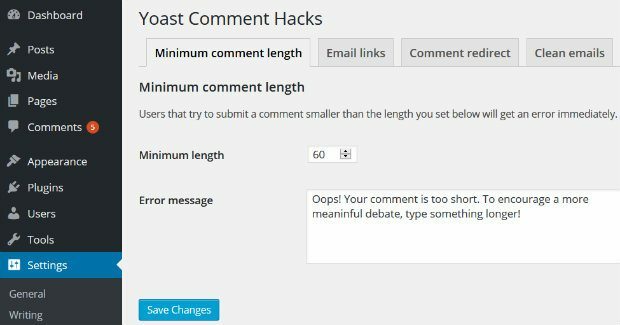 The Yoast Comment Hacks solution to this problem is simple: set a minimum comment length. By encouraging users to leave longer comments, you’re also encouraging them to say something meaningful. If users leave a comment that’s too short, they’ll see an error message instead. If you’re looking to build a loyal audience, you’ll love this second module: comment redirect. With this module activated, first-time commentators are automatically redirected to a page of your choosing. It’s by far my favorite of the plugin’s five modules—just consider the possibilities of building a dedicated thank you page. This allows you to redirect your commenters to a page optimized for growing your mailing list and social media following, as well as linking to your best newbie-friendly content. Nested comments allow visitors to respond directly to other users’ comments. This is a great way to promote a meaningful discussion, rather than one-off, disjointed comments. Unfortunately, people make mistakes—it’s easy to respond to the wrong comment. This can kill a promising discussion in an instant. By default, WordPress offers no way to rectify this problem. With the Yoast Comment Hack plugin, however, there’s a quick fix: the comment parent edit module. The plugin adds a new Comment Parent metabox at the bottom of the edit comment screen. Just fill in the comment’s parent comment ID, and voilà! The comment will be nested below the correct parent comment. To simplify this task, Yoast Comment Hacks adds an Email Commenter button to the comments screen. Simply hover over the comment you want to respond to, then click the relevant link. You might also want the option to email all commenters on a particular post. Yoast solves this problem, too, adding an Email All Commenters button to the WordPress admin bar. Just make sure you’re looking at the right post before you click it, or you could email the wrong set of commenters. On one hand, I get quite excited when I receive an email notification informing me about a new comment. On the other hand, it serves as a reminder of just how ugly the default comment notification email is! It’s hardly life changing, but it is a significant improvement. With so many meaningless and spam comments, it’s understandable that WordPress users are getting frustrated with comment management. If you want to make your life easier, the Yoast Comment Hacks plugin is a great place to start. Each of the five modules offers something useful, plus the plugin is lightweight and really easy to use. There’s minimal configuration, so you can effectively just activate the plugin and go. If you want to improve the way you interact with your audience, be sure to download Yoast Comment Hacks from the WordPress repository. Have you used Yoast Comment Hacks? Share your thoughts in the comments below!